Invasive oriental bittersweet up close: the red-orange berries, with their contrasting yellow capsules, attract fruit-eating birds which spread the seeds far and wide in their droppings in late winter. People like to gather oriental bittersweet for seasonal decorations. The berries are small, about one third of an inch, and grow abundantly along the vine. Once the leaves are down, some of us enjoy one of the old-fashioned pleasures of living in a town such as Westborough that still has a rural character in spite of rapid development. We venture out to clip sprigs of bittersweet for a decorative fall bouquet, or perhaps a wreath on the door, but disappointingly, it’s an invasive plant that we bring home these days. Oriental bittersweet (Celastrus orbiculatus) is now easier to find in town than ever before. This non-native woody vine is lovely in late fall, with its glistening red berries and their opened yellow capsules. Unfortunately, the vine spreads rapidly and threatens to overwhelm and outcompete native plants, altering the ecology of landscapes. Massachusetts prohibited the importation, propagation, and sale of oriental bittersweet in 2006. 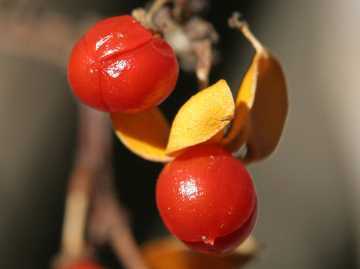 A century or more ago, when people went to gather a fall bouquet, they looked for American bittersweet (Celastrus scandens), a native vine that’s closely related. Our landscape was devoid of oriental bittersweet, which spread into Massachusetts in 1919 after being introduced to the U.S. from China around 1860. Chances are slim that you’ll find American bittersweet around here these days. Today you’ll see oriental bittersweet along “edges” – places where an open area meets the woods. Development creates edges along fields, roadsides, trails, railroad beds, parking lots, and even our own lawns. Oriental bittersweet and many other invasive plants, such as multiflora rose (Rosa multiflora) and Asian honeysuckles, favor these edges. When you walk along an edge environment, look upward. Oriental bittersweet thrives in the sun and climbs up toward it, winding tightly around tree trunks and growing right over shrubs, trees, and other vegetation. The vine is bare now except for those eye-catching red berries and yellow capsules, but in summer its green leaves can shade out everything beneath them, including the trees or shrubs that support the vine. In October, the round leaves turn yellow. You can easily spot masses of them from a car and see why this vine is sometimes called round-leaf bittersweet. Don’t be surprised to find oriental bittersweet on many of Westborough’s open space lands. It grows near the Andrews Street entrance to the Headwaters Conservation Area and near the Bowman Street entrance to the Bowman Conservation Area. It’s one of several invasive plants crowding the edges along the fields at the Town’s recently acquired Lee property. At the Westborough Community Land Trust’s Gilmore Pond, volunteers are working to remove oriental bittersweet (as well as Asian honeysuckle shrubs) along the shoreline and the trail around the pond. Some vines are so thick that volunteers need to use a chain saw to cut them. Oriental bittersweet can spread by suckers from its roots, so even this doesn’t completely remove it. But what about native American bittersweet? Did oriental bittersweet somehow bring about its decline? If so, human hands played a role. As usual with invasive plants, we humans are responsible for bringing oriental bittersweet to North America. We imported it as an ornamental and also planted it along roadsides. At the same time, humans helped to make wild native American bittersweet scarce. How? People picked too much of it in Victorian times. The success of oriental bittersweet is a familiar story that’s played out again and again with invasive plants. The plant became too successful once it was removed from its native environment and introduced into a new environment without the diseases, other plants, and animals that kept it in check. For example, our native white-tailed deer (Odocoileus virginianus) browse on native American bittersweet and keep it in check, but they don’t eat oriental bittersweet. The same goes for rabbits and cattle. A particular fungus in Korea infects Oriental bittersweet and causes the vine to drop its leaves, but no such fungus exists here. Compared to American bittersweet, oriental bittersweet grows in a wider range of light conditions, from full sun to partial shade. Conservationists also worry because oriental bittersweet can form hybrids with American bittersweet and may contribute to replacing the native plant in this way. Birds, of course, eat the berries of oriental bittersweet, both here and in its native environment in China, Japan, and Korea. We tend to think of a plant as being harmed when part of it gets eaten, but that’s not the case when birds eat berries. Instead, birds are a key part of the plant’s success story. Seeds inside the fruit usually pass safely through the birds’ digestive tracts and quickly get spread far and wide. Areas with fences, wires, hedges, or low shrubs often have oriental bittersweet because birds perch there and leave droppings with seeds. Not all birds eat fruit, but many of our native birds do so in winter when insects are scarce. Robins, bluebirds, catbirds, mockingbirds, northern flickers, and cedar waxwings, yellow-rumped warblers, and ruffed grouse all eat oriental bittersweet berries as winter progresses. These berries are low in fats and so aren’t the first ones these birds eat, but the birds get around to them. Ironically, a big consumer of oriental bittersweet berries is a non-native bird, the European starling (Sturnus vulgaris), which itself is sometimes considered an invasive species. About 100 European starlings were introduced into New York City’s Central Park in 1890-91, and now they’re one of the most abundant birds in North America. European starlings compete with native birds such as bluebirds and woodpeckers for nesting space in tree holes. If you’re not sure you’re looking at oriental bittersweet, how can you tell native American bittersweet from invasive oriental bittersweet? The most obvious difference is where the berries grow. American bittersweet berries grow in clusters at the ends of twigs, but oriental bittersweet berries grow all along the vines (from where leaf stems join the vine). American bittersweet leaves are also longer and more pointed. In Asian folk medicine, oriental bittersweet has served to treat rheumatoid arthritis and bacterial infections. Native Americans used American bittersweet in similar ways and others. As with many medicinal plants, the berries and all other parts of both plants are potentially toxic to humans. Do we need to give up gathering oriental bittersweet for our seasonal decorations? Not necessarily. Just be sure to dispose of it properly. Put it in a dark plastic garbage bag and send it to the landfill. If you remove oriental bittersweet from your property, consider replacing it with native Virginia creeper (Parthenocissus quinquefolia), which has red foliage and blue berries in the fall. If you plant American bittersweet (Celastrus scandens), get both male and female plants so you’ll have berries.